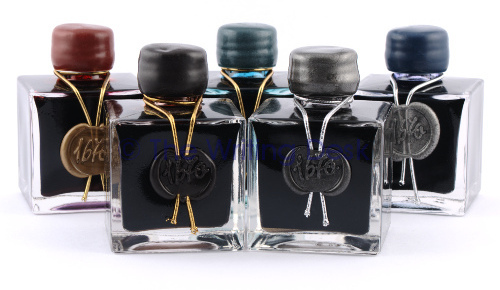 A range of inks from J Herbin celebrating 1670 - the year the company was founded. Packaged in a luxury bottle with wax style seal. This ink contains micro gold particles to impart a shimmer to your handwriting. Photo above for illustrative purposes only (left-to-right: Rouge Hematite, Cyprus Carob / Caroube de Chypre, Emerald of Chivor, Stormy Grey, Ocean Blue).